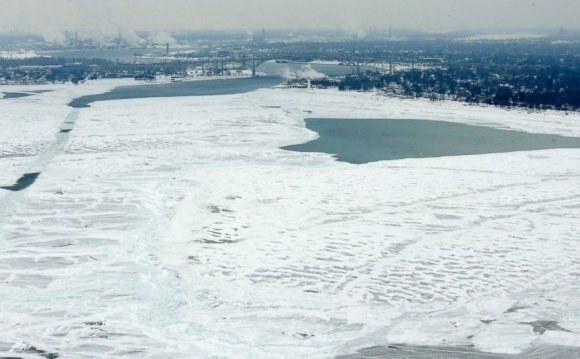 Ice coverage on the Great Lakes reached 85.4 percent on Feb. 18, marking the second winter in a row that ice coverage has exceeded 80 percent. This figure has fluctuated up and down slightly since then and was at 88.8 percent as of Feb. 28. Of course, last year the Great Lakes went on to record their second highest total ice coverage in records dating to 1973. As this graph from the Great Lakes Environmental Research Labratory shows, the last time ice coverage was over 80 percent in back-to-back years was in the 1970s. Specifically, it happened three years in a row from 1977-1979. The long-term average peak ice coverage since 1973 has been about 51 percent. As of Feb. 28, ice concentration was the highest on Lakes Erie (96 percent), Huron (96 percent) and Superior (95 percent). Will ice coverage reach last year's peak of 92.5 percent? It's not out of the question that it could get close considering last year's peak was on March 6. We'll be tracking this story over the next couple of weeks, so stay tuned. Until then, if you need a reminder of what spring looks like, here's an animation showing Lake Erie on May, 31 2014, compared to Feb. 15, 2015.